This The Shipwreck Arcana review is based on 12 plays, including at least one game at each player count. 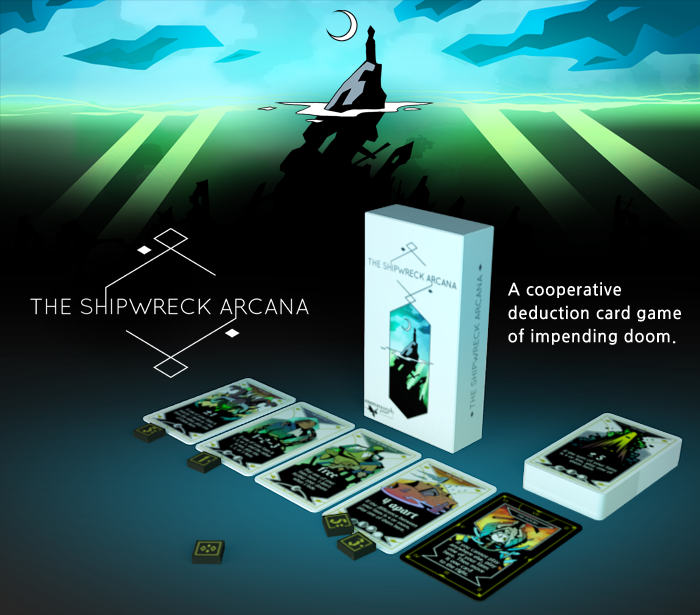 The Shipwreck Arcana is a cooperative deduction game in which you are fortune tellers attempting to prevent your teammates from suffering horrible fates. It was designed by Kevin Bishop and is published by Meromorph Games. To begin a game of The Shipwreck Arcana, everyone will get their own set of seven Number Line tokens. You’ll then place The Hours card on the table along with four Arcane cards. Finally, you’ll put all of the Fate tokens in the draw bag. The Hours card will have two tracker tokens on it. One of the tokens tracks your doom and the other tracks your correct predictions. Your goal is to get seven correct predictions before the doom token reaches hour 7. On your turn, you will draw up to two Fate tokens. After that, it will be your job to give your teammates information about one of those tokens so they can guess what the other one is. You help them out by playing one of the Fate tokens on an Arcana card. 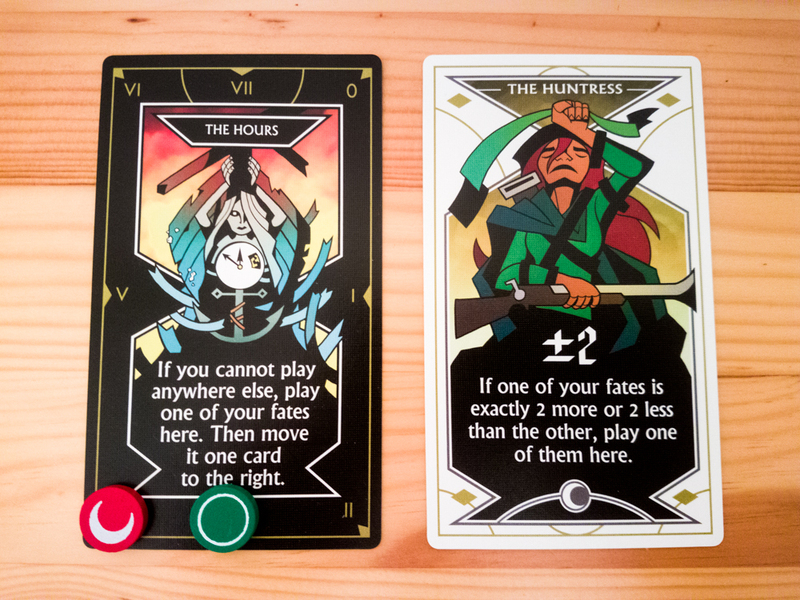 Each Arcana card has text that tells you if you can legally play one of your Fate tokens on it. For example, with the Arcana card The Noble, you can place a Fate token there if one of the tokens is a 3, 4, or 5 and the other isn’t one of those three numbers. Sometimes none of the Arcana cards on the table can legally be used. In those cases, you place the Fate token on The Hours card. This actually does give your teammates information, though, since they’ll know you couldn’t place the Fate token on any of the other cards. After your teammates have seen you’ve placed the Fate token on The Hours card, you’ll then move it to the Arcana card directly next to The Hours card. Every time you play a Fate token, you are hoping that you are giving enough information to your teammates so they can deduce what you have in your hand. Each turn you should give them at least some information, which allows them to flip over some of your Number Line tokens (the ones that you have canceled out with your clues). The Arcana cards also have “fading” points. Each Fate token has a number of pips on it, representing hours spent on that task. If the number of pips ever meets or exceeds a card’s “duration,” the card fades. If you didn’t make a correct prediction that turn, the doom token moves up two spots and the card gets flipped over. If you did make a correct prediction, the card simply gets flipped. Once an Arcana card is flipped, the team gains a new one-time-use ability and you add a new Arcana card in the old one’s spot. Every time a correct prediction is made during the game, you get to move your tracker forward one spot on The Hours card. If anyone makes an incorrect prediction, the doom token moves forward one spot. On some turns, you could have to move the doom tracker forward three spots if an Arcana card fades and you make an incorrect prediction. And that’s about it. If you can beat the doom tracker to 7, you win! You can up the difficulty by placing the doom token further up the track at the beginning of the game. The best moments in this game come when you have two or three Arcana cards that you could potentially use on your turn. You’ll often have to decide whether it’s worth it to take a chance on a card that will fade over the safer options. Sometimes you’ll have an obvious choice, but in a lot of cases you have to really think about how your teammates will respond to your picks. There is a real sense of accomplishment when you beat The Shipwreck Arcana. This is especially true when playing with three or more players. The game length seems perfect. The doom token can move pretty quickly right from the start so there’s quite a bit of tension for a 10-15 minute game. We haven’t had a chance to use it yet, but The Shipwreck Arcana has drop-in/drop-out, which means that you can easily join the game late or leave the game after it’s started. You simply pick up or put away your tokens and continue the game! This is a great travel game. You can pack everything into the bag, it has a small footprint, and it takes no time at all to set up and put away. 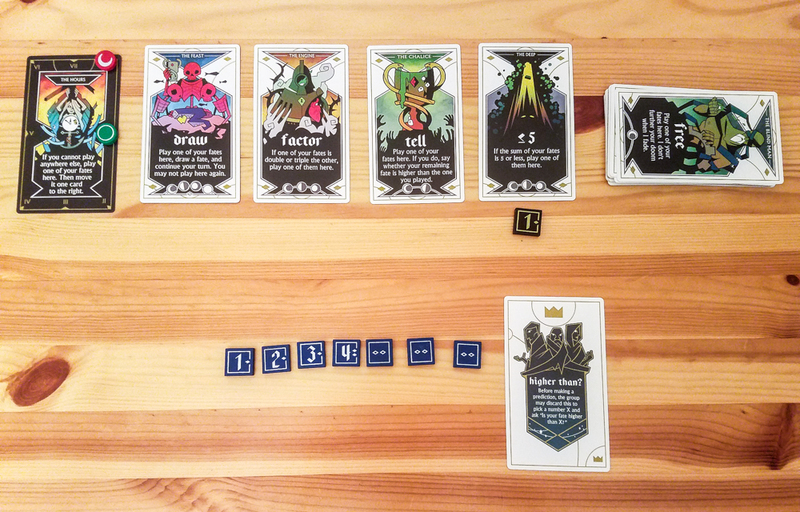 The Shipwreck Arcana is pretty good as a two-player game, but it’s much better with more players because you can talk to each other about why someone used a Fate token the way they did and come up with predictions together. It’s a more complete cooperative experience with more players. There’s very little theme here. It’s really just a number-guessing game with some nice artwork. That’s not a big problem for us, but some people do prefer co-op games with a bit more theme. Hanabi and The Ravens of Thri Sahashri are probably our favorite small-footprint cooperative deduction games, but The Shipwreck Arcana isn’t too far behind those two. It’s a highly interactive puzzle that is a great filler for 3-5 players. It’s also quite challenging at the two highest difficulty levels. If you like deduction games and/or co-ops, you’ll probably want to check out The Shipwreck Arcana. Thanks for taking the time to read our The Shipwreck Arcana review! To stay updated on all things cooperative board games, follow us on Twitter, Facebook, or via RSS.